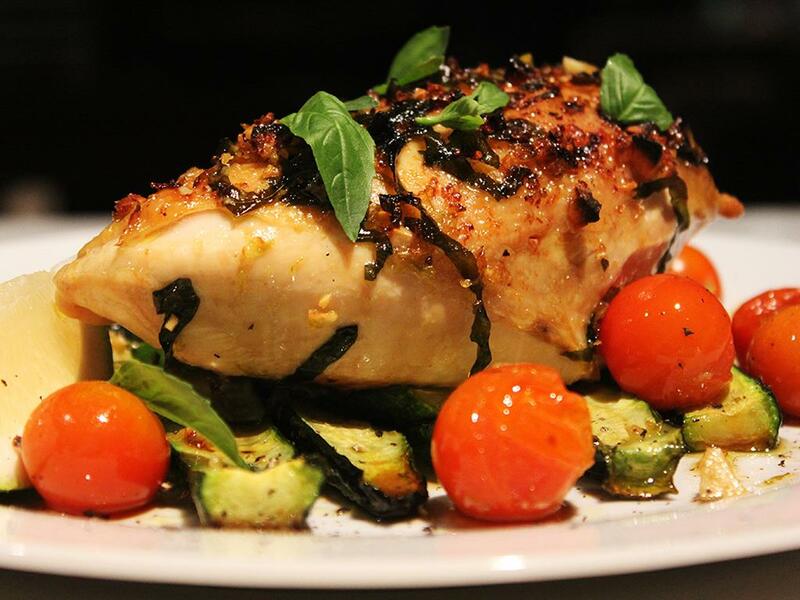 Quick, easy and flavourful roasted chicken dish with courgettes and cherry tomatoes. Grate the peel (only the yellow/green peel not the white part) off the lemons (to create lemon zest) and then cut the lemons into wedges. Place the lemon zest, garlic, olive oil and half the basil into a bowl and mix together. Place the courgettes slices onto a backing tray and then place the chicken on top. Spoon over the basil mixture. Sprinkle with coarsely ground salt. Roast for 10 minutes. Add the tomatoes and roast for a further 8 minutes or until the chicken is cooked through. To serve, place the chicken, courgette slices and cherry tomatoes on the plate. Top with the remaining fresh basil leaves and add lemon wedges on the side. Squeeze a little lemon over the chicken. "Amazing very tasty and easy to prepare "